Anand Balgram, is a home for deprived children. 8-10 children live with a Mother. The Balgram is taking care of 108 such children ensuring homely atmosphere and education for better prospects of each child. Balak Mandir, a remand home accommodating 150 children. The initiative was conferred with Child Welfare National Award by Hon. President in 1995. 2. Utkarsh Vocational Training Center : Utkarsh Vocational Training Center was established in 2009 with an objective to motivate the school going children towards job oriented courses and to equip the rural unemployed youth with technical skills. The training emphasizes on life skills and value education. The youth, trained at the center, either start their own business or join the respective industry. The training center won the Platinum Jubilee Award by IMC for Employment Generation in 1988. 3. Sagroli Sunrise : The sunrise project started in 2006, aim to promote rural athletes. The students who received support through the project have bagged many prizes in many athlectic events at district and state level. The project was awarded Real Heroes of the Nation Award by CNN IBN in 2006. 4. The Village Knowledge Center : Established in 2004, The Village Knowledge Center has been empowering the rural people with power of ICT. The project won the best VKC award by Microsoft in 2009. Low cost houses for the shelter-less. Till now SSM has provided help to more than 500 families to construct low cost houses. Women Self Help Groups (SHGs) established by SSM are now working confidently as a federation at Sagroli, Dist. Nanded. SSM also works for the welfare of working Donkeys through Equine Welfare Project in Nanded district. Rao Kamble, a backward class girl, was dwelling in Sagroli village. Her father used to work day and night for livelihood. She lost her father due to illness at the age of 10. Her mother became completely helpless and was unable to bring up the family. Being the eldest among 6 sisters, she had to quit her school and start working as a housemaid to support her family. SSM provided her free education with all the study material up to SSC. After her SSC exam, she expressed interest in pursuing Assitant Nursing course offered through SSM’s vocational training programmes. A generous family from Sagroli village agreed to support her with the course fee. She successfully completed the course with earnest and active participation. Now she is working as a full-time Assistant Nurse at the Champaben Nanalal Hospital. She is not only an independent person but a financial support to her family. This change in a rural girl has enhanced the economic condition of her family. Her example proved to be helpful in spreading the importance of vocational education among the community, motivating more deprived youth to join the centre. 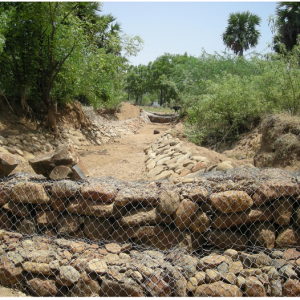 In 2008, the government has constructed check dams in the villages for water management in Sagroli village. But there was no provision to oversee maintenance of the check dams and even the farmers/villagers neglected taking care of it. Eventually, the check dams became non-operational. The water ways were blocked to such an extent that looked like there never had been a check dam. SSM took the initiative and conducted a survey to explore the issues and current situation in the villages. SSM explained the solution and benefits of renovating and de-silting the check dams to the villagers. The intervention appealed to the villagers and they agreed to help in completion of the work. SSM renovated the dam, made waterways clear by digging and de-silting. This resulted in an upswing in livelihoods of the farmers. The villagers were benefitted with increase in agricultural productivity, water level, and fodder for animals and milk production. Over a the period, the fully working check dam helped villageer seek sustainable income generation opportunities. 1 Arvind Deshmukh Asst. Secretary Rich experience in education and sports development. 2 Shyamrao Sagrolikar Member Vast experience in income generation and agricultural development programs. 3 Khanderao Shinde Member Ex Head Master of SSM school with experience in education and child development programs. 4 Pramod Deshmukh Chairman Yes (Brother-in-law: Aruna Deshmukh) Vast experience in education and watershed development programs.